Other 10 Herbs You Can Grow Indoors In Water All Year Long! 10 Herbs You Can Grow Indoors In Water All Year Long! 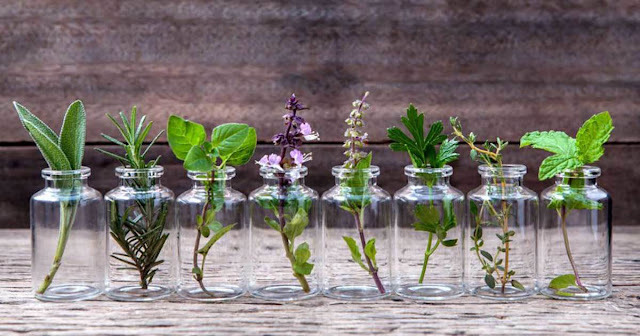 Herbs are the inevitable part when it comes to cooking. They give flavor to foods, and they provide notable health benefits. With most foods, one thing is certain fresh is always better. This is in comparison to dried regarding flavor, nutrient retention and color. But the bad news is that winter is a hard season for gardeners, and you might be very limited in what you can grow outside. That is, of course, unless you live in a place with a warm temperature climate. Due to this, dried herbs are preferred over the fresh ones. Hydroponic is a system of growing plants indoors. In order to grow vegetables, there is a need for a lot of light and space. However, for growing herbs, all you need to have is a simple set-up, and you will have your own organic herb garden no matter the season. Below you will see some of the herbs you can grow in water indoors. Full plants might be rooted from whole leaves with its base intact or with the help of trimmed stems unless otherwise noted. Remember one thing all herbs need bright direct light in order to thrive. Intrigued? Read on to find out more. Oregano is a staple of Italian cooking which is simple and easy to grow indoors. You need to pinch off its top leaves as the oregano grows to make new ones. You should know that the oil of the oregano is a virtual panacea, it works as an antioxidant, antibacterial, antiviral and antifungal agent. In the spring, take a couple of springs from an outdoor plant and put them in shallow water. The sage will rapidly sprout roots. Make sure not to crowd this herb, since it needs a plant of airspace in order to avoid mildew. Also, you should make sure not to let the leaves touch the water. The sage is a herb which is known to improve memory, lower the signs of menopause and relieve anxiety. This is a variety in the mint family but with a milder flavor in comparison to peppermint. Spearmint is used for women with ovarian cysts and for post-menopausal women thanks to its anti-androgen effects which balance those hormones. Tarragon is a versatile herb in the marigold and sunflower family which has a mild flavor. This herb moderates blood glucose, acts as a powerful antibacterial agent and helps treat metabolic syndrome. Grow it in a sunny, warm spot from fresh leaves you need to pick in the spring. This is a member of the mint family. The great thing about this herb is that insects mainly mosquitoes hate its smell. Once you include it in your indoor garden, make sure to change its water at least once on a weekly basis in order to prevent root rot. You should know that the lemon balm lower anxiety, helps digestion and heals cold sores. The best way to use is to prepare it as a tea. Nowadays, stevia is becoming a popular natural sweetener. Instead of making sure you are getting the organic stevia and, not the one that is genetically modified, grow your own. According to one study, stevia can lower the desire for nicotine and help stop smoking since it seems that there is a connection between nicotine craving and sugar. You should know that this herb doesn’t like the cold. Therefore you need to keep it in a consistently warm spot. You must keep this herb moist, give it a spritz with water in order to prevent its leaves from drying out. This herb benefits from judicial pruning in order to encourage new growth. The thyme has phytochemical thymol which is known to lower blood pressure, ease stomach disorders, eliminate fungi and bacteria, and prevent tooth decay. The thick stems of rosemary might take time to grow roots, but this herb does quite well when is in a sunny window. Rosemary has a sharper taste when fresh than dried. It is a flavorful presence as a garnish, as a meat rub, in soups, and stews. You should know that it is said that rosemary can improve cognitive function and memory, stimulate the growth of hair and moderate blood glucose. When outdoors, the mint tends to spread out, so growing peppermint indoors prevents it from choking out other plants in the garden. A prolific and hardy herb, peppermint is an amazing addition to savory desserts and salads. It can soothe irritable bowel syndrome, keep mice and spiders out of the house, lower the pain of a headache and relieve stress. The basil is essential when it comes to the Italian and Asian cuisine. This is a herb which is easy and simple to grow in water. Just cut off the stem you plan to root right before the parent plant flowers. So, you should know that the basil is abundant in antioxidants, is a powerful antifungal, antibiotic, and antiviral agent, and last but not least it moderates blood glucose level.